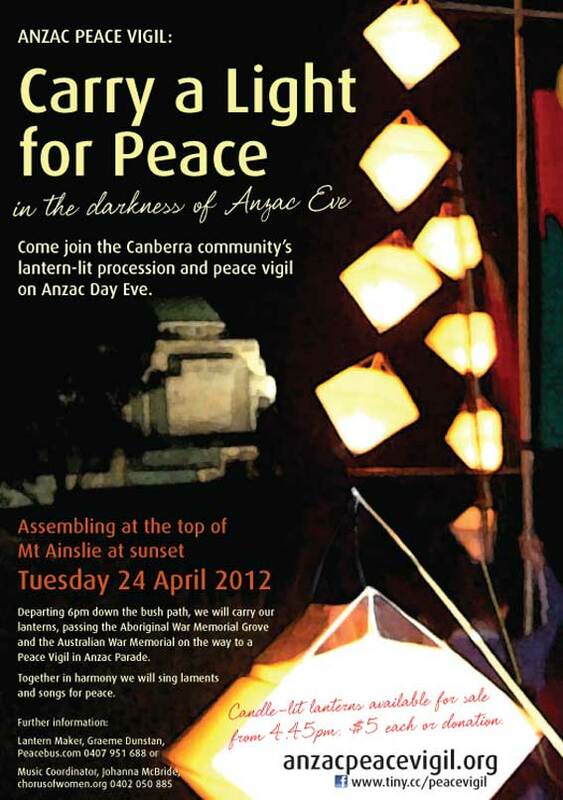 Preparations are under way for Canberra's second annual Anzac eve Peace Lantern Parade and Vigil. The event is a citizen-based initiative that aims to broaden the Anzac commemoration as we approach its centenary in 2015. Last year over 150 people gathered on top of Mt Ainslie and, in lantern light, walked down the mountain, past the Aboriginal War Memorial, to the Remembrance Nature Park, and then on past the Australian War Memorial to an all-night lantern-lit Vigil in Anzac Parade. Such was the beauty of the event, with lanterns and singing, that organisers are expecting many more participants this year. Three hundred lanterns are being prepared under the direction of master lantern maker and long-time cultural activist, Graeme Dunstan. "When Auntie Jude Kelly (a Yamajti-Noongar woman from West Australia) and Glenda Cloughley (Canberra songwriter) sang together at the top of Mt Ainslie last year, I felt that I was witnessing something very profound", said Anzac Eve Peace Vigil spokesperson, Dr Janet Salisbury. "Two mothers - one Aboriginal and one white - standing together and singing for the spirits of dead children lost in war. It was very, very moving." Johanna McBride of Canberra's A Chorus of Women will once again be coordinating the music for the event. The Chorus are preparing a range of music for community singing as well as some of their own brand of original songs that draw on the arts to voice a deep longing for new peace stories to inform our cultural identity and shape our children's future. The Chorus will be joined by other Canberra singers and musicians. "Like last year's ceremony, we will remember the dead, the environmental destruction of war and the traumatic impacts of war on individuals, families and our culture through generations," said Janet Salisbury. "We will acknowledge the frontier wars and the ongoing suffering of Aboriginal people, refugees and migrants, remembering that almost everyone in this country has a family story of trauma and loss through war." I think it is important to respect the service men and women who served and suffered in the defence of their country." "But unless we can also build cultural stories around the common humanity that we share across all cultural and national borders, our governments may continue to engage in unwise wars against people who are not our enemies." Date: 24 April 2012 Wear warm clothes and bring food and drink to share. 8.30 pm: Parade assembles for an all-night lantern-lit Vigil in Anzac Parade. 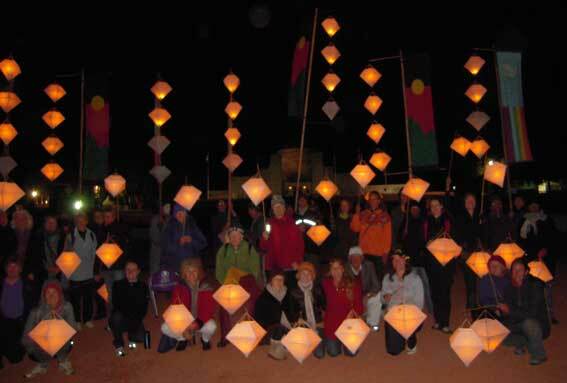 A Chorus of Women and other singers will be rehearsing and we will have some lanterns on display. Dr Janet Salisbury and others will be available for comment.